Ben is seen with a number outfits throughout the years. In this article, we pick what seems to be the classic one. Ben wears a white T-shirt with black strips, green military cargo pants, black and white sneakers, and a watch-like gadget. Does this look interest you? See below to learn how to craft this look by yourself! 1 White T-shirt Get a plain white T-shirt. 2 Military Green Cargo Pants Match the T-shirt with a pair of military green cargo pants. 3 Black Duck Tape Grab a plain black sticking tape and scissors. Then proceed to cut the tape and put it on the shirt as you can see in the picture. Don't forget the sleeves too! 4 Black and White Sneakers Pair up the outfit with black and white sneakers. 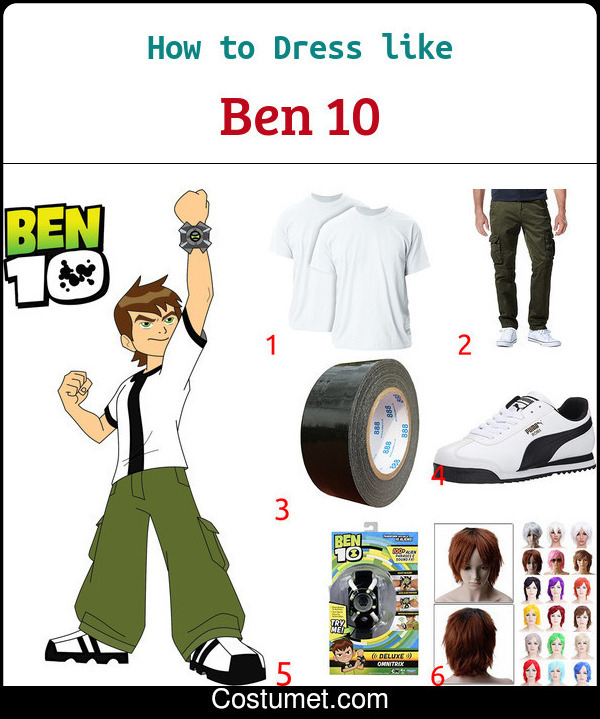 5 The Omnitrix How can you be Ben without the Omnitrix?! 6 Short Brown Wig Wear a short brown wig to replicate Ben's hair. Ben 10, produced by Cartoon Network Studios, is an American animated TV series and movies which launched to the public and gained popularity since 2005. The plot revolves around the boy named Ben Tennyson who owns the Omnitrix, an alien gadget that grants him the ability to transform into 10 different alien creatures and occupies their power. Ben, with his out of space power, has to save the world by fighting against alien threats from many places in the space. The franchise has been receiving a huge amount of popularity from around the globe, as well as raving review from critics. So far, it also won three Emmy awards, confirming its quality.